Today, in 1968, American astronauts on Apollo 8 became the first men to orbit the Moon. 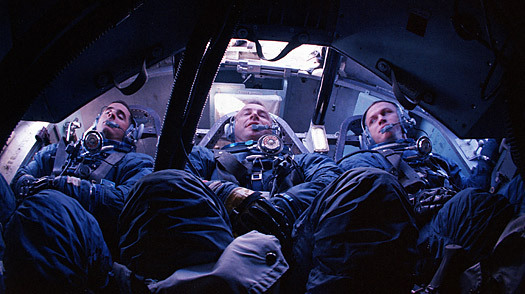 The three-man crew consisted of Frank Borman (Commander), James A. Lovell, Jr. (Command Module Pilot) and William Anders (Lunar Module Pilot). Not only was this the first manned flight to and from the Moon, but Apollo 8 served to validate many of the technical procedures necessary to support upcoming lunar missions. During ten lunar orbits, the astronauts took star sightings to pinpoint landmarks, surveyed landing sites, took both still and motion pictures and made two television transmissions to Earth. It was also the world's first manned flight to escape the influence of Earth's gravity. Launched on 21 Dec 1968, the mission lasted 6 days 3 hours until recovery on 27 Dec 1968.